Double Double recently just opened early September. It took the old spot of where West Lake used to be – well there was another restaurant after, but that closed too. My parents spotted it one time, and decided to go check it out for brunch. We weren’t sure what time it opened, so we got there around 10:15 am. It was actually open at 10:30, and surprisingly, customers were already waiting in line eager to get in. I’m guessing everyone heard about this new restaurant since the owners used to own another restaurant apparently. Anyways, once the doors opened at 10:30, everyone bombarded into the doors, and we were quickly seated. Good thing we had a table of three, so we got to sit at the booths. If you were a table of 2, you most likely had to sit at the large round tables with randoms – much like what they do in Asian countries. It was insane, because as I sat down, I saw that all the seats were already filled and there was already a lineup. I feel sorry for those people, since it literally meant they had to wait for a table who had just sat down to finish their meal – probably at least a 30 minute wait. Good thing we got there early! When we were ready to order, pretty much everyone else was – as you can imagine since everyone was seated at the same time. This caused some chaos as everyone wanted their orders taken, but the servers seemed to use a systematic method by just going down the row one by one. We got our orders taken, but wow was the wait long to get our food. We literally sat there for at least 25 minutes with no food. Since I was bored out of my mind, I looked over since I was seated right next to the kitchen where they made handmade steamed rice rolls. This was actually one of the reasons we came, since handmade rice rolls can be difficult to make and really depends on the chef. These rolls were made by the owner’s wife I believe. 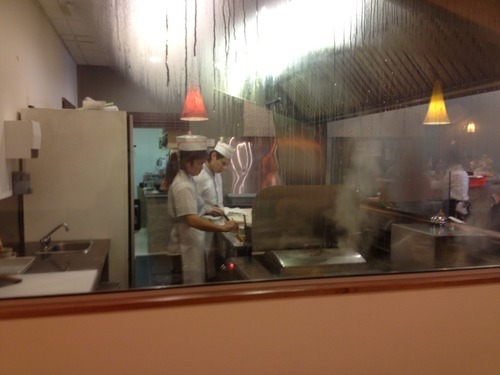 It’s a tough job because you have to stand in front of hot steam and you also have to touch the burning hot rice roll in order to roll it and such. I watched as the order lists she received piled into a stack of a ridiculous amount. I told my parents that we would probably be here for a long time waiting for these steamed rice rolls. Finally, after roughly 30 minutes, we got our Plain Congee. Like really? It takes 30 minutes to make some congee that has no other ingredients in it? Pretty ridiculous. And of course we ordered the congee hoping to dip our Salted Chinese Donuts in, but nope, they were not present. 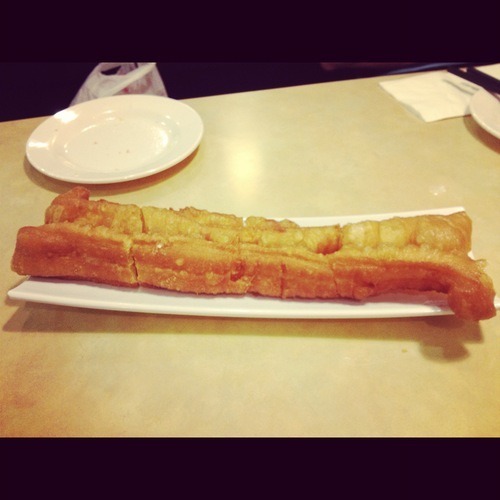 We waited another 5-10 minutes, and finally got Sweet Chinese Donut. We could at least dip that in our congee so it wasn’t too bad. I actually really enjoyed this as I liked the hint of sweetness in the donut. My dad however, said that he saw that these donuts were being made by this really young guy. He didn’t seem to really know what he was doing, and he took extremely long rolling out the dough. I’m guessing they actually roll the dough as they are being ordered or something. All the donuts were also sold out within 30 minutes as I heard other customers ask in disbelief. 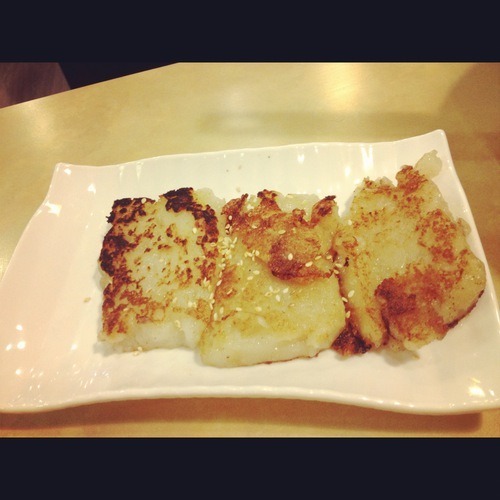 We also got the Pan Fried Radish Cake, which when presented, we thought looked extremely ugly. It just didn’t look appealing. Upon eating it though, it tasted pretty good and the batter was soft in the inside and crispy on the outside. 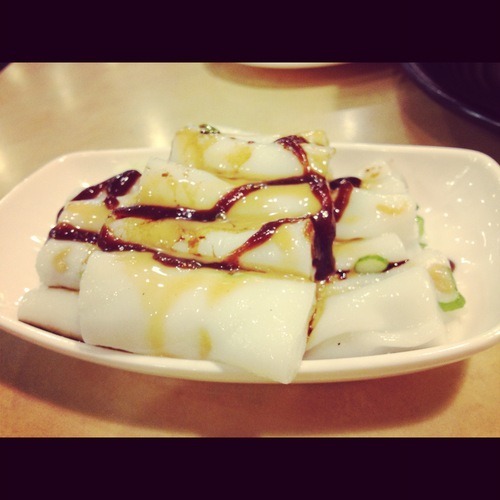 Soy Sauce Pan Fried Rice Rolls? 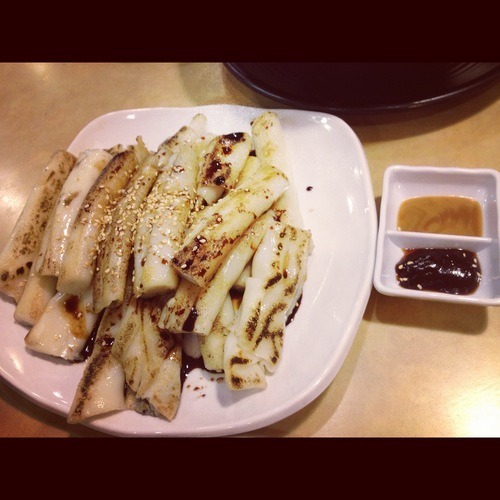 We also got the Soy Sauce Pan Fried Rice Rolls. At least I think that’s what it’s called, since my mother ordered that separately after we had taken the order so I never checked it out on the menu. These rice rolls were not handmade, and you could tell when you bit into it. It was much more tough and the layers were thicker. These were also pan fried so it had a little burnt texture to it. The flavours really were based soley on this special soy sauce they had, but even with that, I didn’t think it was flavourful. I had to dip it into the other two sauces that accompanied it (peanut sauce and sweet sauce) to really get some flavour. And then we finally got our Steamed Rice Roll served with Mixed Sauce. This is probably the most simple steamed rice roll, with just dried shrimp inside. It is then topped with a mixture of sauces. It wasn’t too bad. The layers were thin, but I’ve had thinner ones. This really takes skills to make though. The rice rolls were also very smooth. My parents agreed that we could get better ones at actual dim sum restaurants though. And we wouldn’t need to wait this long! 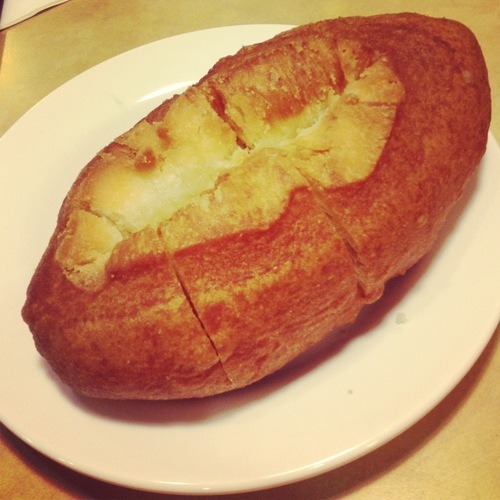 And last but not least – our Salted Chinese Donut. 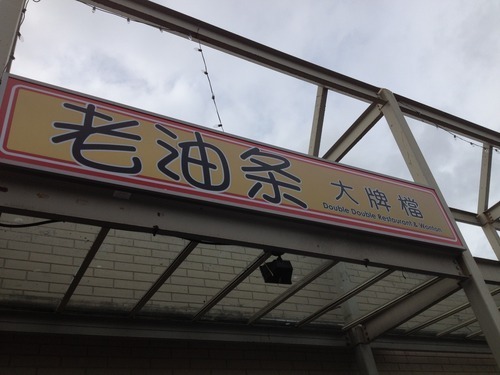 We literally had finished all our food, although we each kept a bowl of Plain Congee, which had gone cold. We sat there for probably another 20 minutes waiting with no food. We were even tempted to just cancel the order. It had already been more than 1.5 hours since we came. We were afraid we would get ticketed for our parking too. This was ridiculous. The table behind us had also finished their food and they seemed to be waiting on their Salted Chinese Donuts as well. They finally came and they were not bad. Our congee was already all cold, so dipping it in wasn’t as great as we had hoped. My mom also said that she could get the same quality donuts at other Asian bakeries. Overall, the wait is way too long. They seriously need to figure out their process flows and work on their capacity management. Figure out what their bottlenecks are or some sort. 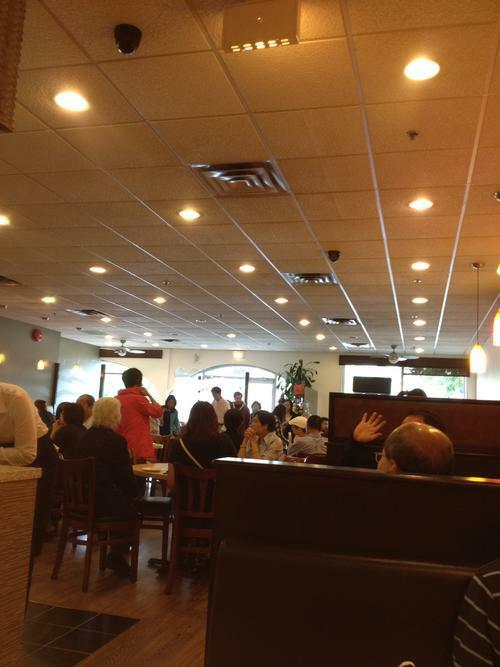 I don’t think any customer, including myself, would wait 30+ minutes to eat at an Asian brunch restaurant. It makes sense to be eating for 2 hours at a dim sum restaurant, but definitely not at a place where you would assume you can get a quick meal. Food quality isn’t even that amazing and there is nothing that I can’t get elsewhere. My family also heard from friends that there were complaints as to the quality of food. Definitely not going back again unless they fix their problems with waiting time.